I am a Kelowna, British Columbia area artist working in acrylics, pastel and mixed media. 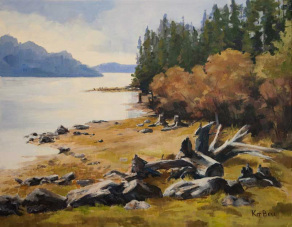 I enjoy painting the landscape both in the Okanagan and across Canada. Many of my paintings were done on location in the Canadian Shield area in Northern Manitoba. This country is amazing in its diverse landscape and my goal is to capture as many parts of it as possible! I invite you to look around my Gallery pages. Click on any image to enlarge it. 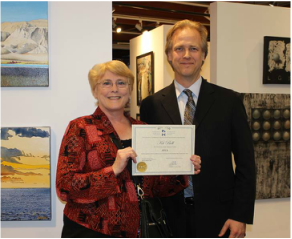 I am very honoured to be granted AFCA (Associate Signature) status with the Federation of Canadian Artists in 2015. I would like to thank the jurors who considered my work for FCA shows in the past. The process of applying for FCA shows and building a consistent portfolio has been invaluable in gently steering my artistic development over the last several years. The “declined’s” have been just as important in my development as the “accepted’s” (although not as much fun!). I look forward to continuing along my artistic journey and to continuing my involvement with the FCA and the Central Okanagan Chapter. For more information on the Federation of Canadian Artists and Signature Status, click here.